At the electronics flea market on Saturday, I found a 3ABP7 dual gun CRT. This one was built by DuMont, most likely intended for the 3″ version of their 5″ Type 279 Dual Beam Oscilloscope. So of course I had to fire it up. There are two sets of deflection coils, so I drove them with one deflection board and cross-wired the deflection coils to flip the image around on the second gun. 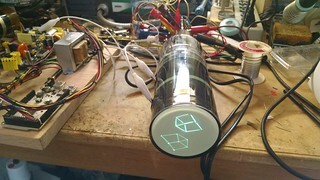 The guns themselves have a common cathode connection and separate grids, which forces me to drive them both in parallel since my deflection board video amplifier keeps the grid at a constant potential and drives the video onto the cathode. Here’s a closer look at the guns. 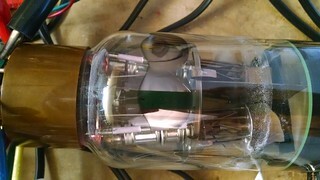 The filaments are connected in parallel so this tube uses twice the normal current. could this be driven with two deflection boards? would it require two video amplifier bias supplies or could both deflection boards share a single 1 kv power supply board and single bias supply? Ok, I get it now – I was confused by your circuit because most scope clock circuits are controlling the grid, not the cathode. If I left the video signal on all the time could I use two deflection boards to run the two guns independently? I realize this wouldn’t allow me to blank the cursor between moves (unless I made some modifications for grid control) but I think that might be ok. I like your circuit for some regular scope tubes I have but I also happen to have a couple of these tubes.